Notes: Claig Castle was a stronghold of the Clan Donald or MacDonald in the south of Scotland. 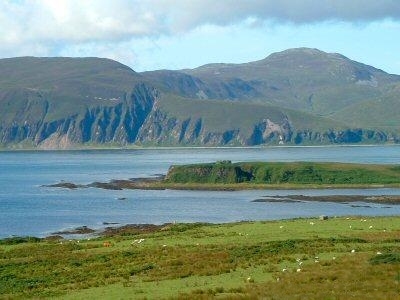 The castle was once a massive fort described as a sea fortress, which allowed the Macdonald Lord of the Isles to dominate and control the sea traffic north and south through the Hebrides for more than four centuries. The castle remained a stronghold of the MacDonalds until they were subdued in the 17th century by the Clan Campbell.The castle is located at grid reference NR471627 on the Isle of Fraoch Eilean which is just off the Isle of Jura, Scotland.